Tana, in the Nablus district, is one of the Palestinian communities Israel wants to annihilate in its ongoing ethnic cleansing drive that is perpetuated with impunity since 70 years now. The roughly 300 people have lived on their lands since before Israel’s occupation began but Israeli military orders have defined the area a ‘firing zone’ and declared the homes and structures of the community illegal. Homes have been repeatedly demolished and anguished families have been dirvenn to live in caves. Last year, Stop the Wall and the Land Defense Coalition have agreed with the community that if living in the caves is the best solution to defend the land and livelihoods of the people, then these caves need to be at the very minimum inhabitable, so that they can offer a modest but dignified home for the families. 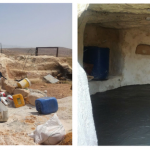 This year, Stop the Wall and the Land Defense Coalition together have started in voluntary work days to restructure the caves to ensure they are safe, healthy and pleasant living spaces. Last week the first four caves have been finished to the excitement of all involved. “We are truly pleased that through an effort of solidarity and collective voluntary work we have been able to give the first family in Tana a space of resistance and dignified existence. “Israel wants to expel or bring the community to its knees. Instead we have created homes and hope to provide solar energy for them.